DAVAO, Philippines - Philippine President Rodrigo Duterte declared a “state of lawlessness” Saturday after suspected Abu Sayyaf extremists detonated a bomb that killed 14 people and wounded about 70 in his southern hometown. 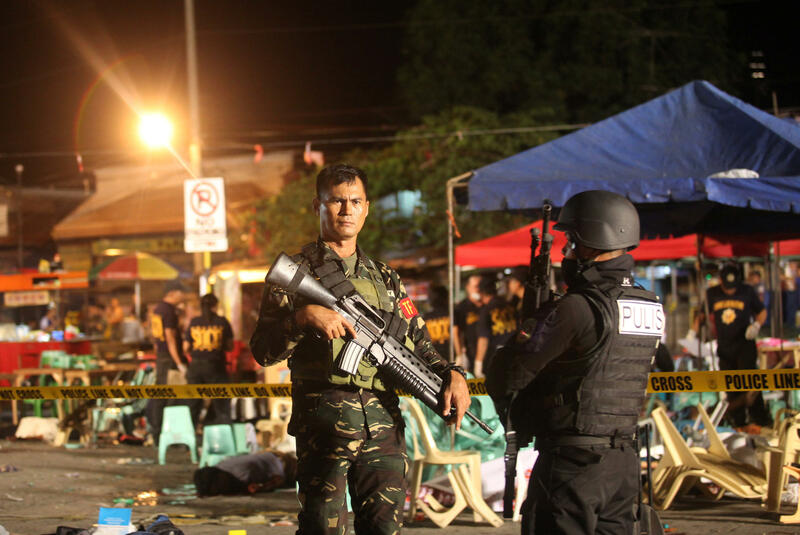 Duterte, who inspected the scene of Friday night’s attack at a night market in downtown Davao city, said his declaration that covers the southern Mindanao region did not amount to an imposition of martial law. It would allow troops to be deployed in urban centers to back up the police in setting up checkpoints and increasing patrols, he said. “These are extraordinary times and I supposed that I’m authorized to allow the security forces of this country to do searches,” Duterte told reporters at the scene of the attack, asking the public to cooperate and be vigilant. “We’re trying to cope up with a crisis now. There is a crisis in this country involving drugs, extrajudicial killings and there seems to be an environment of lawless violence,” said Duterte, who served as mayor of Davao for years before elected to the presidency in June. Police immediately set up more checkpoints in key roads leading to the city, a regional gateway about 610 miles south of Manila. Police forces in the capital also went on full alert at midnight.